And here's a mostly enthusiastic take from a couple of reporters living literally across the street from the arena, on Dean Street between Flatbush and Sixth avenues, saying the consensus was "this was the block party to end all block parties," and the hassles were surmountable, even if the celebrities were not all friendly. But it truly deserved the descriptor surreal. 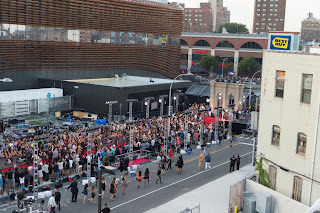 There were Miley Cyrus and Katy Perry and Austin Mahone gamboling on the red carpet--not the red carpet hugging the arena sidewalk, the strip that led through the faux Brooklyn Bridge next to the faux (gray) brick wall, to the stage that near the former location of the beloved (and relocated) Freddy’s Bar and Backroom. 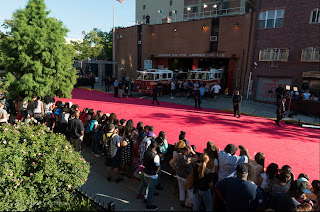 This was the red carpet in the street, which led past the Dubai Mini Mart and Engine Company 219, with the low-rise brownstones and brick buildings indelibly signaling Brooklyn. From the window of an apartment near that corner, the scene was the same, only louder, much louder. Roaring their approval were hundreds, maybe thousands, of orchestrated extras, mostly teens, plus some fraction of locals and the guests they’d eased past the police barricades. So, were the extras/visitors screaming their heads off? Sure they were. And no, it was not explained that "red carpet activity" would include that screaming. Below is the reaction to Miley Cyrus on the red carpet. Below is the reaction to Austin Mahone on the red carpet. Here's coverage of the overall show/scene from the Brooklyn Paper. Here's Jody Rosen's review on NY magazine's Vulture, focusing on Miley Cyrus's "minstrel show." By tapping the Barclays Center to host the awards program, MTV became the latest media giant to recognize and ratify what everybody in the New York metropolitan area knows: Brooklyn is on the rise. 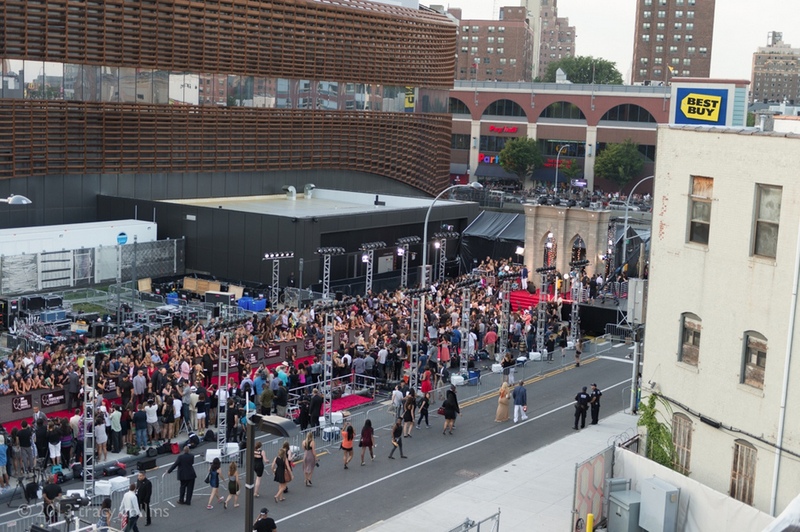 The network gave a bear hug to the borough, rounding up locals to dance to the performances and broadcasting clips of Brooklyn-based movies on the monitors between performances. Timberlake made good use of the full arena (including its elevators and concourses) during his mini-set. Crowds had gathered by the morning, before the cops clearing some people away, but by 6:15 pm everything was set:, the sidewalks were jammed with extras, the house music was pounding, and the crowd roared on cue, getting pumped for the big event. For a good number of people on Dean Street, it was a party, inviting friends for exclusive views. 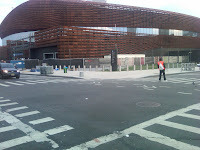 Others scored free tickets in a last-minute goodwill gesture from the Barclays Center. At one point, approximately 3:00, I asked a group of people "please don't sit on the steps." After having to repeat myself at least twice, one of them asked me if it was my house. I said yes, and again firmly said "Please don't sit on the steps". After they finally got up, a man in the group walked up to me and yelled that he didn't like the way I told his daughter to "get off the steps", he said he didn't care if I lived there and I had no right to talk to them that way. I reminded him that I had to ask several times for them to not sit on the steps before they got up. After ranting in a every aggressive and threatening manner, he insinuated that "maybe tomorrow he would come back and I wouldn't have a house any more, he would take care of that". A neighbor of mine stepped in and asked the man to back off and move away. As my neighbor is a man, and as the police came down the street at the same time, the man left, gently escorted by the police. ...We were promised that only residents would be allowed on our street. “The network gave a bear hug to the borough,” according to one report, citing the deployment of Brooklyn imagery and local extras. If so, it was a bear hug with limited outreach to those whose homes would provide such an authentic backdrop. As Krashes observed, "the information about the number of people let into the block was significantly understated." Also, he said, "we were told they were going to bleachers... they were on people's stoops." “Money talks,” observed a world-weary resident after the crowds had gone, as we surveyed litter on the sidewalk. This morning, I'm told, the street clean-up is less than complete, and, though all streets were supposed to be open by midnight, that wasn't so. After the show, money kept talking. Dean Street was still blocked off, except to admit an armada of limos that had double-parked on nearby streets. 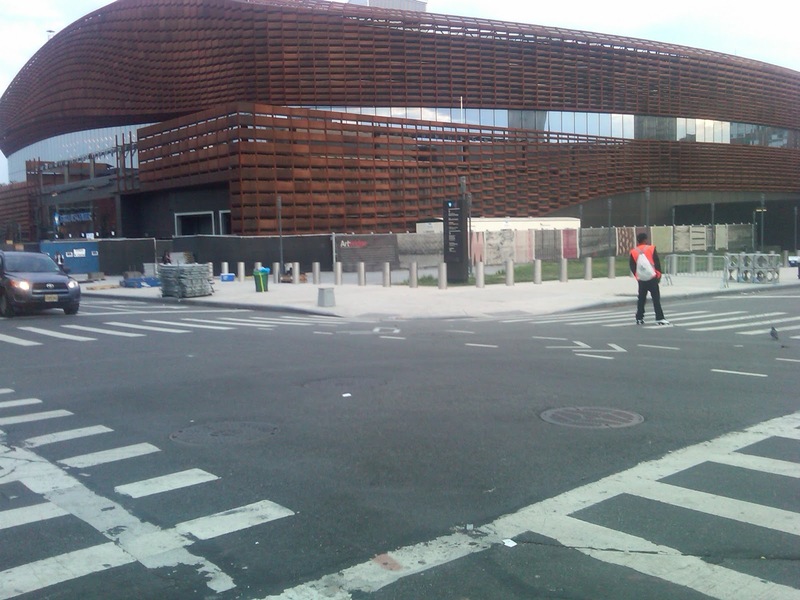 Then, after being waved in, those VIP vehicles zipped west down Dean--the wrong way, on this one-way street--past Sixth Avenue to the arena, picking up their precious cargo. 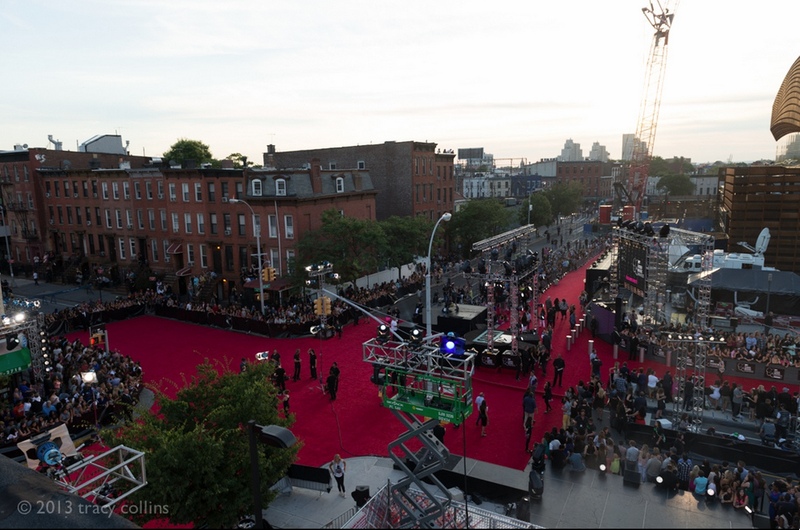 There were more idling and double-parked limos/vans on Prospect Heights streets waiting for the show to end than I'd seen for any other event, including Barbra Streisand and the Rolling Stones. There was a line on Carlton Avenue, as noted in the video below. In the video below, vehicles are being waved from Carlton onto Dean to go west--wrong way on the one-way street--to the arena. This Atlantic Yards Watch report points to numerous examples across Flatbush Avenue in Park Slope. Versailles clothing store had a promotional party going on, tied in with the MTV awards, with amplified music blasting onto the street and a large, milling crowd partying on the sidewalk. One storefront over, at 198 Flatbush, they erected a photo backdrop and photographers (apparently hired by the store) were working from the middle of the sidewalk. The entire sidewalk was crowded to the point of impeding pedestrian traffic either physically or by intimidation (because of the large crowd, not because of any threats. It was a party atmosphere). 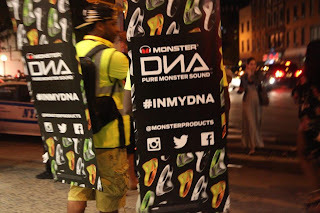 One visitor counted more than 50 vendors or promotional people handing out flyers and other souvenirs on Flatbush Avenue between Bergen and Dean Streets. The resident in the video below was frustrated by the cops: "How many times do I have to show my ID for them to recognize that I live here?" Note: It was the Mayor's Office and MTV who did not attend any public meetings in advance of this event. Compared to the other entities involved in the planning of the VMAs, the local precinct was relatively accessible to the local Block Association. 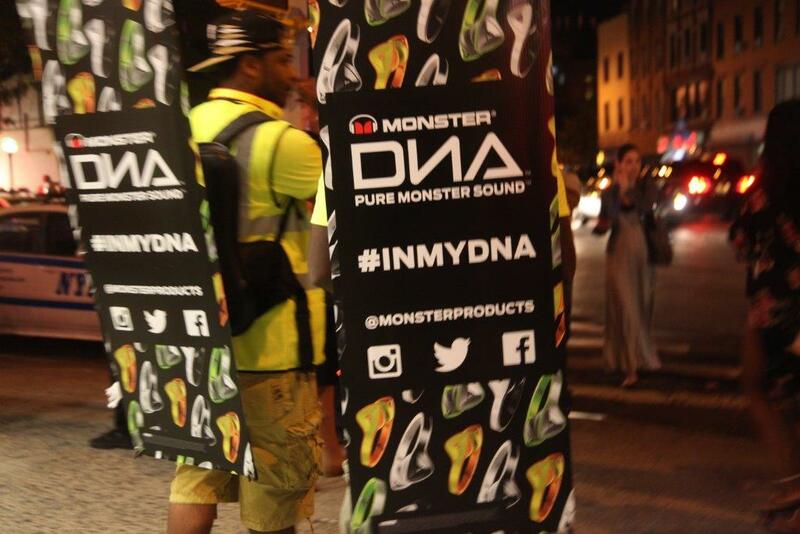 NYPD was visible on the ground implementing the security plan for a production given wide latitude in the middle of a residential neighborhoods by Commissioner Oliver and the Mayor's Office of Media and Entertainment. Because they are on the ground, they end up being the focus of the criticism even though it is the Mayor's Office who approved MTV's plan. This resident blamed MTV for an event that was "kinda like a shitshow... we accommodated them, and they did not accommodate us." This resident said the strictures were "not too bad." "We're giving up our lives for something I do not benefit from, at all," this resident said. This resident said, "I felt like a prisoner, can't even go to my corner store."